Whether it was named for the Roman mythology involving the fire of volcanoes or for the species in Star Trek (and possibly a tribute to Leonard Nimoy? ), the Aston Martin Vulcan is here. Depending on where the name came from, this car will either erupt with power or boldly go where no car has gone before. The Aston Martin Vulcan debuted at the Geneva Motor Show in 2015 and then made its way to the New York Auto Show. This awesome supercar is built to be a fast track only race car and is targeting Aston Martin's most daring and wealthy customers with a starting price of $2.3 million! It is also extremely rare, with plans for only 24 cars to be made. The Vulcan will not be approved to race against other cars, but is designed to compete with other Vulcans. The limited number of lucky owners with also be given a support package that includes access to simulators, as well as exclusive track days to practice their skills before they really get behind the wheel. The Aston Martin Vulcan will be powered by a 7.0 liter V12 petrol engine, with more than 800 horsepower. That power will be sent to its rear wheels from an Xtrac six-speed sequential transmission that is taken from Aston Martin's Vantage GTE. This car had better be fast, for the amount it costs. The body will be a carbon fiber monocoque style which is similar to the Aston Martin One-77, but will be improved and made lighter and stiffer thanks to the engineering firm Multimatic. It will feature an FIA-approved roll cage, adjustable dampers and sway bays, and a pushrod system. The Vulcan will also have carbon ceramic brake discs with Brembo calipers and an antilock brake system courtesy of Bosch. Other features will include limited-slip differential, advanced traction control system, and a magnesium torque tube with a propeller shaft made from lightweight and strong carbon fiber. At $2.3 million, it will need all the bells and whistles to make it worth the sticker price. The Aston Martin Vulcan was designed by creative officer Marek Reichman with inspiration coming from the current Vantage and DB9 models. Aston Martin claims the name Vulcan was actually taken from the Avro Vulcan, which was a bomber plane used by the Royal Air Force during the Cold War era. With its sleek design and super power, maybe this car will actually be able to fly! 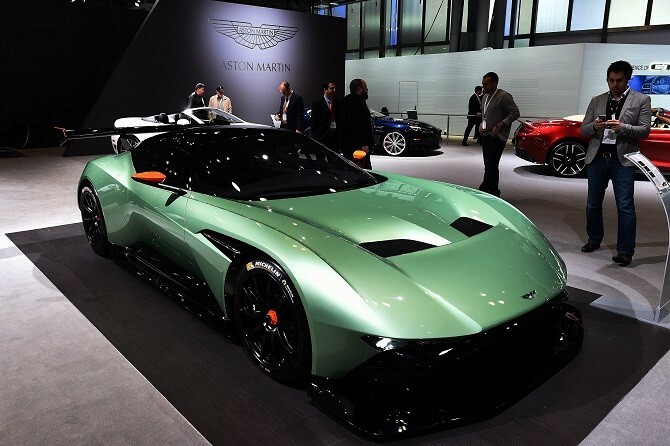 While Aston Martin has priced their new Vulcan at $2.3 million, a dealer in the Cleveland area has marked it up more than $1 million to a sticker price of $3.4 million! Never let it be said that having a $10 billion net worth, like Roman Abramovich, doesn't offer its benefits, when it comes to the enjoyment of leisure time.